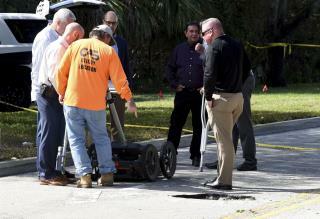 (Newser) – It started out as public works employees checking out a potential sinkhole or pothole; it ended up with the FBI trying to solve what the Sun Sentinel is now calling a "bank caper." What the workers spotted in the hole in Pembroke Pines, Fla., on Tuesday that raised eyebrows: an orange power cord stretching southward. Cops, and then the FBI, were called, and further digging turned up digging tools, a wagon to transport earth, a hauling device, a power generator, dirt-covered boots, and a tunnel that reached toward the woods on one end and headed toward a Chase bank on the other, per WPLG and the Miami Herald. "This was not an overnight thing," says FBI Special Agent Michael Leverock, who adds that the "unique" scene looked like something out of a movie. digging a moat to see it it stops the illegals in miami from going north?